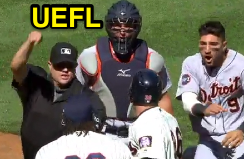 HP Umpire Jordan Baker ejected Tigers P Matthew Boyd and Twins 3B Miguel Sano (Throwing At & Fighting) in the bottom of the 5th inning of the Tigers-Twins game. With one out and none on, pitcher Boyd threw a first-pitch fastball behind batter Sano, resulting in a bench-clearing incident during which Sano threw a punch at Tigers catcher James McCann. Replays indicate the pitch was located significantly inside and head-high, the call was irrecusable. At the time of the ejection, the Tigers were leading, 3-2. The Tigers ultimately won the contest, 5-4. This is Jordan Baker (71)'s first, second ejection of the 2017 MLB regular season. Jordan Baker now has 4 points in the UEFL Standings (0 Previous + 2*[2 MLB + 0 Irrecusable] = 4). Crew Chief Mike Everitt now has 6 points in Crew Division (4 Previous + 2*[0 Irrecusable Call] = 6). This is the 11th, 12th ejection report of 2017. This is the 3rd player ejection of 2017. Prior to ejection, Boyd's line was 4.1 IP, 2 ER, 3 SO. 0 HBP. This is the 4th player ejection of 2017. Prior to ejection, Sano's was 1-2 in the contest. This is Minnesota's 2nd ejection of 2017, 1st in the AL Central (MIN 2; DET 1; CLE, CWS, KC 0). This is Detroit's 1st ejection of 2017, 2nd in the AL Central (MIN 2; DET 1; CLE, CWS, KC 0). This is Matthew Boyd's first career MLB ejection. This is Miguel Sano's first ejection since April 10, 2016 (John Hirschbeck; QOC = N [Balls/Strikes]). This is Jordan Baker's first ejection since March 22, 2017 (Bill Haselman; QOC = Y [Equipment]). Wrap: Detroit Tigers vs. Minnesota Twins, 4/22/17 | Video via "Read More"